This is the time of year when it seems like every second counts! While many knitters and crocheters may start to think about their holiday knitting in the mid- to late summer months, many are also carefully making their holiday crafting lists now! With several weeks between now and the time of gift giving, we have several ideas to inspire you. Consider quick-to-knit wearable accessories including cowls, mittens, and hats. Need a gift, but don't want to have to worry about the item fitting the recipient? One skein of Manos del Uruguay Wool Clasica will yield four re-useable hot coffee cup sleeves. Ravelry user Carajv used Clasica in these teacher gifts! CelticKitten also used Wool Clasica in the Cabled Kindle Sleeve. A fun and sometimes unexpected gift is a stuffed animal or "softie". 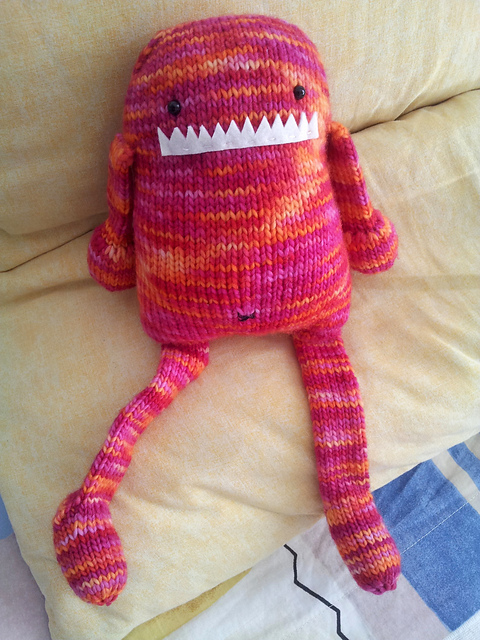 On Ravelry, Indra used less than a full skein of Manos del Uruguay Maxima to create this version of Iris, the Gourmet Monster. Of course we don't want to ruin any holiday surprises, but we do love to see your work. If you can, we'd love for you to share your photos on our Facebook page, in our Ravelry group or Tweet us @manosyarns! Happy crafting!